This is long overdue, but I wanted to share a few other sites I've been happy to be apart of for some time -- contributing ideabooks for the home design site Houzz, and creating moodboards for a party column on the inspiring A Subtle Revelry. Above is a peek at some of the boards. Victoria and I come up with themes together, I create the moodboards, and she adds thoughts to each post (all of them can be found here). The most recent board I designed includes a roundup of my favorite party fonts -- find the full post here! I love these roundups! 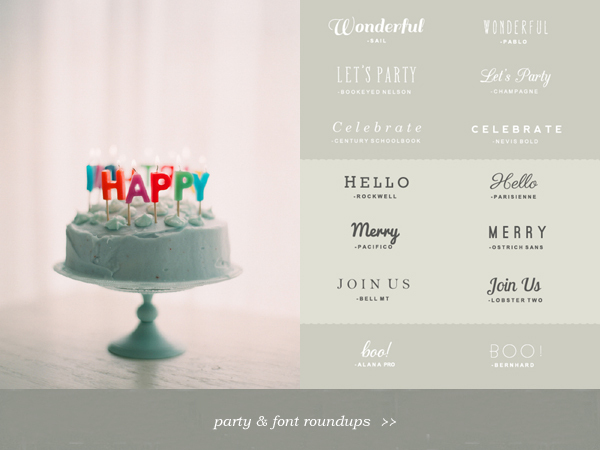 Thanks for sharing these fonts, they are so perfect for parties! Wow, those are some gorgeous ideas in your roundups! Love the ideas for mom and dad's birthdays, too, from awhile back. Wonderful roundups! Thanks for sharing the lovely fonts!! They'll be suitable for almost anything!